I too was a little nervous buying speakers that I couldn’t find a review on or listen to before hand. For the price-to-functionality ratio, I decided to bit the bullet. 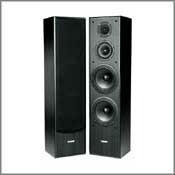 I ordered the AV-5 floor speakers. As for somebody that buy’s via online frequently, I was very impressed with the fast shipping. Moreover, the speakers were packaged extremely well. When I plugged them into my Denon AVR-1603, I was impressed with the clarity and crispness of the sound. I’m still in the 10/20 hours for the break-in period, so I have not cranked them up just yet and I not sure I need to, there penalty loud for my needs. I’ve tested the sound on DVD’s, CD’s, MP3’s, and the stereo. Music tested was techno, hip-hop, old school rap (thumping bass), rock, blues, and jazz. Everything sounded rich & crisp. I did think the bass was a tad light, but after a receiver adjustment it was fine. I haven’t set my system with the bi-wire setup yet, so that might make a difference. However, I think bass is a subjective thing for people. I definitely recommend the AV-5 model. I was really nervous when I purchased these speakers because I couldn't find a single review. But since everyone seems to love Fluance's AV-HTB, I thought their more expensive speakers couldn't be too bad. Well turns out these sound much better then the only other option I found for the price (Quest Engineering speakers), which I am using as surrounds. They also sound better then any bookshelf speakers I've heard. I use them as mains for watching movies and listening to techno and hiphop (LFE goes to these because I don't have a subwoofer yet). For movies and techno they are fantastic. For heavy bass hiphop beats however they first sounded a little thin. This really surprised because I thought the twin 8" woofers would be more then capable of handling the bass. So I tried turning up the bass on my RXV540 Yamaha receiver and boom! The whole house shakes. However, they can distort some when asked to play lots of bass at higher volumes (about 2/3). This may be fixed if I bi-wire them (or bi-amp), but they still play more then loud enough for now. When the setting on the receiver are at default they will play beyond the threshold of pain!